The 2018 eruption on the Lower East Rift Zone of Kilauea Volcano was a remarkable event in many regards. 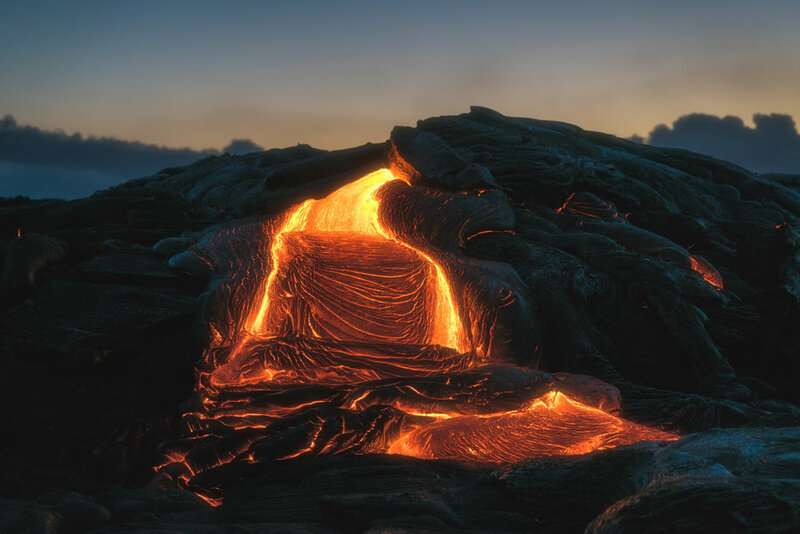 From early May through mid-August scientists and society alike bore witness to voluminous amounts of lava erupted out of a new fissure system that formed within the middle of the Leilani Estates subdivision, ultimately destroying over 700 homes and creating 875 acres of new land. This eruption was fed by the draining of a magma reservoir stored at the Kilauea summit; the draining of this magma caused significant collapse features in the Kilauea summit caldera, including the deepening of the Halemaumau caldera by ~1000m. This deepening occurred progressively over the space of 3.5 months and was accompanied by daily M > 5 earthquakes that caused significant damage to local buildings including the U.S. Geological Survey’s Hawaii Volcano Observatory building. Fortunately, casualties from the eruption were few in number. This is attributable to a number of factors, including: 1) A good monitoring network that was in place prior to the eruption; 2) 24/7 monitoring and boots-on-the-ground presence by HVO staff, supported by USGS and academic scientists from other observatories and universities; 3) An engaged Hilo County Emergency Management Division that rapidly and effectively responded to events as they unfolded; 4) The establishment of good communication and trust between HVO staff and the Hilo EMD well before the eruption began; 5) An ability for the USGS to rapidly deploy personnel as the crisis rapidly expanded in scope; 6) An extraordinary effort on the part of USGS scientists to provide up-to-date information on social media platforms (e.g., the USGS Volcanoes Facebook page), which were used as primary information sources by local residents as well as the international scientific community. There are places in the Cascades where a similar eruption could unfold. These include Newberry Caldera near Bend, OR, and also in the greater Portland area which has had a series of cinder-cone-style eruptions occur over the last several million years that collectively form what is known as the Boring Lava Field. It’s important to note that such eruptions are much less likely than in Hawaii; Newberry’s last eruption was 1300 years ago, and the last cinder-cone eruption in the Portland area was ~50,000 years ago. In contrast, over the last 1000 years the entire surface of Kilauea volcano has been resurfaced by lava flows. Other Cascades-relevant lessons from the Kilauea volcano include the importance of having monitoring equipment in place before unrest begins; the importance of continuously engaging stakeholders in the emergency response community, in land-management agencies, and in communities near volcanoes so that when a volcano wakes up there is broad familiarity with roles and responsibilities as well as the nature of volcanic hazards; and the importance of having good working models of volcanic systems to help interpret the significance of various unrest phenomena associated with the movement of magma. Seth Moran is a seismologist and Scientist-in-Charge (SIC) for the U.S. Geological Survey’s Cascades Volcano Observatory (USGS-CVO) in Vancouver, Washington. CVO, one of five U.S. volcano observatories, has responsibility for evaluating volcanic hazards, monitoring activity, and communicating hazards information for volcanoes in the States of Washington, Oregon, and Idaho. CVO houses ~75 full-time employees, roughly half of whom work full-time on Cascade volcanoes. Seth has been studying Cascade volcanoes since 1988, when he began his graduate studies in seismology at the University of Washington in Seattle. Seth joined the USGS in 1997 as a staff seismologist for the Alaska Volcano Observatory, where he studied volcanoes in Katmai National Park, assisted in establishing monitoring networks on several Aleutian volcanoes, and participated in the response to the 1999 eruption of Shishaldin volcano. In 2003 he moved to CVO, just in time to take part in the response to the 2004-2008 eruption at Mount St. Helens. He also helped establish and/or expand monitoring networks at Mount Rainier, Mount St. Helens, Mount Hood, Three Sisters, Newberry, and Crater Lake volcanoes, and, since 2015, has been serving as the SIC for CVO. In his free time he enjoys spending time with his family and playing music.